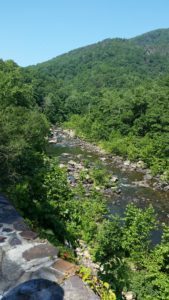 The countryside surrounding Bath County has a number of beautiful scenic drives including State Route 39 through Goshen Pass. This time of year when the leaves start to change, the scenery becomes simply breathtaking. One of our guests this week said that one of his daily excursions was a “Drive through Heaven”. He and a buddy came to Bath County to enjoy some well-deserved rest and relaxation and to ride their motorcycles on the mountain roads. For three days, they took the roads less traveled and told stories about their adventures around the breakfast table the next morning. Before they left this morning, they provided a hand-drawn map of their favorite ride through Bath County. Come visit Vine Cottage Inn; I would be happy to provide you with your own copy of Rich’s “Drive through Heaven Map” and you can judge for yourself!